“Beauty or Beast? SEE the only LIVING woman with this Mysterious and Unknown Ability…Alive…The Ape Girl.” Jack Constantine’s Girl to Gorilla Show is coming to New Jersey’s State Fair Meadowlands, which opens on June 21 for a 17-day run. It’s the first time since 1996 that his Four C Productions is bringing it out. Just a couple of months ago, we wrote in a post about this classic midway illusion: Sadly, there are few if any working today. If you know of one, let us know. 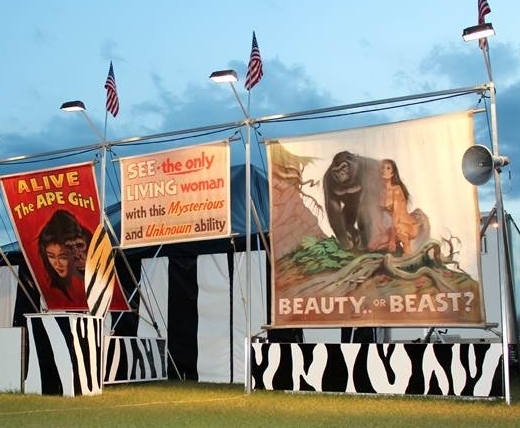 This awesome set of Girl to Gorilla banners was painted by the late great Lew Stamm, whose showfronts are highly regarded in the business. “They were done for my father in 1991. My dad traded his car for them,” said Lindsey Constantine, who is co-owner of the sideshow company. The rest of the set including the ticketbooth is currently being painted prior to its appearance at the fair. It’s the front of the show that gets the dough! The Constantines are also bringing their popular World’s Smallest Woman, World’s Smallest Horse, Snake Illusion and Oddity Museum to the New Jersey fair.